It’s no surprise that our meadow fed British lamb dog food is a real winner with mutts of all shapes and sizes. Naturally increases the look & health of their skin and coat. Meadow-fed lamb is very good for fussy dogs. No more turned up noses. All natural and healthy. No artificial naughty things. Less mess to pick up afterwards. Smaller, less smelly stools. 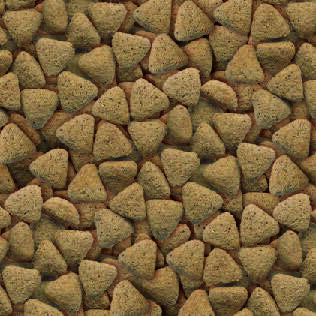 We’ve selected human quality British lamb to make this dog food as appealing as possible for our mutts. Crammed full of flavour to entice even the fussiest of dogs, and containing expertly chosen vitamins and minerals to help our dogs live a long and healthy life. 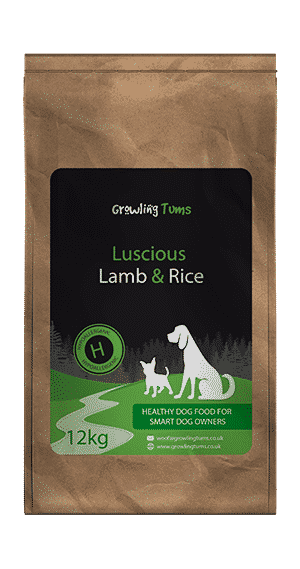 The aroma of our British meadow fed lamb is very attractive to dogs which makes this food perfect for fussy eaters. We refuse to add any of those naughty ingredients that are known to cause issues with certain dogs. It doesn’t have any wheat gluten, beef, pork, soya or wheat. It’s also free from dairy products, eggs and all artificial colours and preservatives. No longer do you need to worry about upsetting your dog. Ingredients: Lamb meat meal (min 26%), rice (min 26%), barley, brewers yeast, poultry fat, beet pulp, yucca, minerals and vitamins. My dog has eaten this for months and is in great condition. Her coat is really glossy and her teeth are in great condition too. She’s the best she’s ever looked. I changed to Growling Tums to try and stop my Dalmatian’s troubled tummy. I don’ think I’ll change again because her problem has been completely resolved and she’s full of energy again. My fussy lab loves this food and I’ve been on a hunt for ages for a food that doesn’t have so many fillers that she poos 5 times a day. This had completely solved that problem! Her coat has improved too. Will be back for more, thank you! My cocker spaniel was changed onto this food because he was drinking excessive amounts of water due to the salt content of his previous food. The problem has been solved plus he loves it. I was recommended to buy the Lamb and rice from this company, so ordered two bags, as one of my Old English Sheepdogs has a very sensitive tummy. I have tried other well branded dry foods of Lamb and rice and salmon and rice, which was supposed to be for sensitive tummies to no avail. I have mixed half of one bag in with the salmon and rice that my OES has been on and from the first meal the stools had firmed up. We are now purely on the Lamb and Rice and it feels like I went all round the woods just to get to the trees. I wish I had come across this food before, I could have saved a fortune and not had the mess with a long coated breed to clean up. WHAT A RELIEF, FINALLY, tummy settled down, she is straight into the food, nice extra firm stools. Everyone a winner. I will definitely be buying this food again. My older OES is on this now and so is My little Apso Gavin, we’re all very happy dogs and definitely one very happy human. Recently switched to Luscious Lamb & Rice because of tummy troubles. Pleased to say both boys absolutely love their new food, not a kibble wasted and no more problems. So glad I found Growling Tums. So far so good for my greyhound with a sensitive tummy. Have tried a lot of kibble most recently Burns&James well beloved however this seems to be more helpful in firm/small output. My chihuahua is allergic to lots of things, which resulted in her chewing her feet, scratching and having loose poops. I have tried many different brands and even fed her a raw food diet for eighteen months. I wanted to try her on this dry food as it is so much easier than cutting up meat and bones. I am thrilled with the results, no more itching or chewing and her poops are perfect :o) Thank you Growling Tums….I will be purchasing some more. I will get the grain free next time. Hope you start selling treats soon. Our English Springer has always been a fussy eater and developed pancreatitis. We were told to put him on a low fat diet by the vet who recomended a well known dry food. Unfortunately his poos were enormous and very smelly. Since being on this lamb and rice his poos are smaller, firm and a lot less smelly. The real bonus though is that he loves it and never leaves a single kibble.